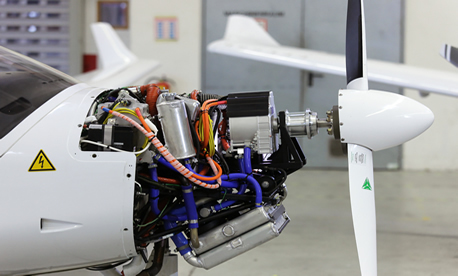 At the weight of just 50 kilograms (110 lbs), this electric engine is the breakthrough in the aviation industry. Viewed from the ground, airplanes appear clean and efficient. They fly at fantastic speeds with no apparent effort, leaving behind only thin streams of puffy white clouds. In reality, airplanes accomplish the miraculous feat of hurling hundreds of thousands of pounds of people, baggage and aluminum thousands of miles at high speeds by consuming huge amounts of fossil fuels. In the process, airlines dump massive amounts of dangerous pollutants over our homes and into our atmosphere every day. Therefore, one of my greatest dreams is to fly on an electric aircraft one day. And now comes the possibility of an entirely new kind of EV: hybrid electrically powered aircraft that could be commercially built and operated. Siemens researchers have developed a new type of electric motor for aircraft that delivers a continuous output of about 260 kW — five times more than comparable drive systems. Thanks to its record-setting power-to-weight ratio, larger aircraft with takeoff weights of up to two tons will now be able to use electric drives for the first time. To implement the world-record motor, Siemens’ experts scrutinized all the components of previous motors and optimized them to their technical limits. New simulation techniques and sophisticated lightweight construction enables the drive system to achieve a unique weight-to-performance ratio of 2.3 kW/lb. The electric motors of comparable strength that are used in industrial applications deliver less than 0.45 kW/lb. The performance of the drive systems use in electric vehicles is about 0.9 kW/lb. Since the new motor delivers its record-setting performance at rotational speeds of just 2,500 revolutions per minute, it can drive propellers directly without the use of a transmission. “This innovation will make it possible to build series hybrid-electric aircraft with four or more seats. The motor is scheduled to begin flight-testing before the end of 2015. In the next step, Siemens’ researchers will boost output further,” said Frank Anton, Head of eAircraft at Siemens Corporate Technology. It’s time to put an end to fossil fuel!